Recently I was asked to create some photographs for a group of year 11 girls at my daughers school for a little cookbook that they had designed. 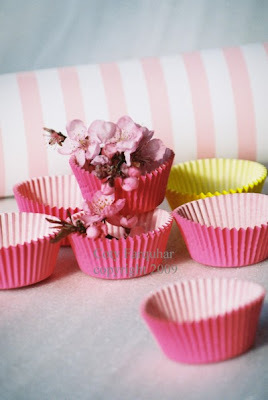 My brief - to be very cute, lots of pink, pretty and full of fun. 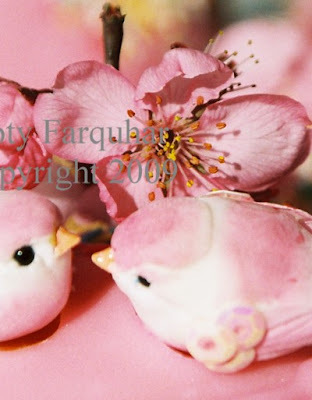 I played around with some little birds, butterflies and lots of cake sprinkles and decorations and I had such a lovely time taking these images. 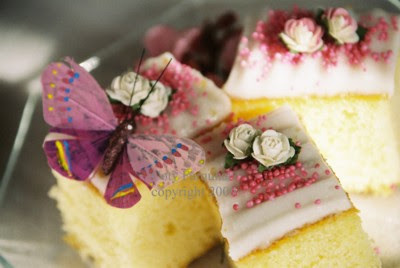 I just love the cake isle in the supermarket, there are so many fantastic little decorations to choose from and the colours and designs of the cupcakes are amazing. I know there are many more designs and decoration available in the U.S. that I have seen in magazines that we Australian's can only dream of. 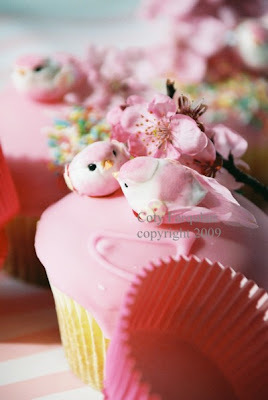 I Love the little Pink birds on the Cupcakes! Happy Pink Saturday! 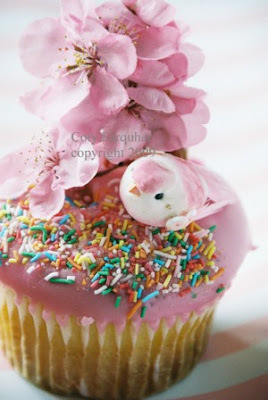 Totally cute and Yummy looking! Thank you for sharing your Pinks! Your photographs with all the pinks are so so lovely. Excellent images, so nicely done. Really enjoyed this post! Hopefully I'll see you next time with more exciting photos. 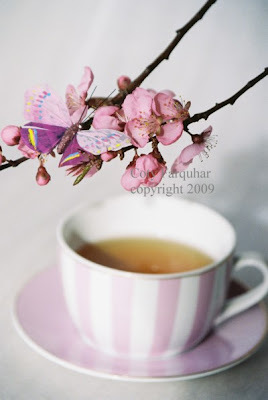 Many Happy Pink Saturday to you! They must have been thrilled with these images. Your talent is such a wonderful gift. You truly have an eye for all that is beautiful. I actually had a pink cupcake at work this week. It wasn't nearly as beautiful as yours, but it was quite delicious. so beautiful! i beg to differ the u.s. has more decorations to choose from, i have never seen anything as cute as your cupcakes in my cake aisles! every pic is a charmer! Wow, just spectacular! Love all of the pink! I am incredibly impressed by your talent with the camera and these fabulous photos! Just amazing! what a lovely - and yummy! - posting of pink goodies! your photography adds so much to them! What yummy looking treats! They are so lovely! Happy Pink Saturday! I absolutely love your photos!! They are gorgeous and make me hungry. (Not a good thing). They are so life like I just can't get over it! 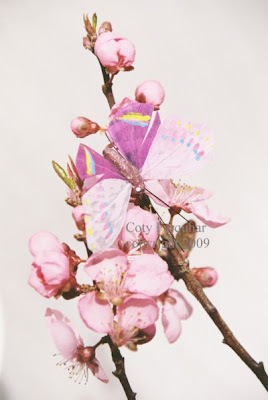 Just wanted to stop by and say I hope you are having a Happy Pink Saturday! 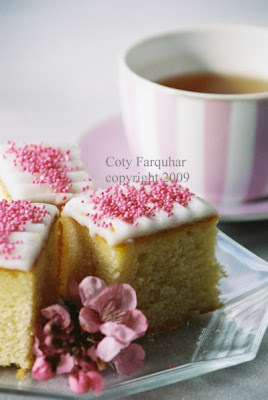 And really great photos of your pink items. I really like the look of your blog!! Hmm Cupcakes, sprinkles, and Pink goodness. 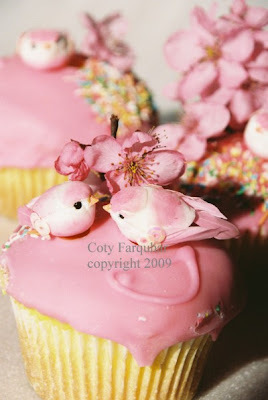 to Top it all off Pink Birdies! Love it. Your photography is amazing. 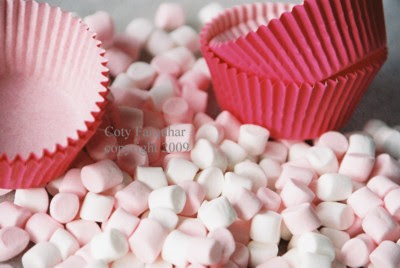 I loved all the pink goodness you created! What a talent! happy Pink Saturday! 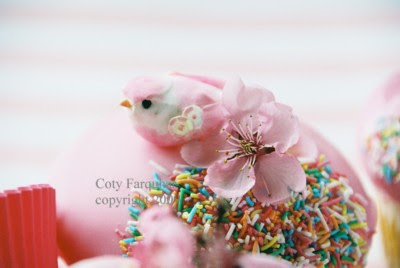 your picture always so pretty.. looks like spring is coming soon and wonder where can I find a real pink bird like the ones on cupcakes.. hehehehehe have a great weekend! Happy Pink Saturday! 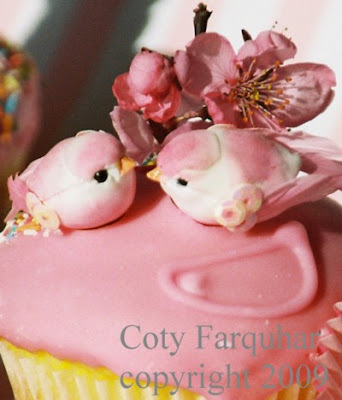 Your photos are beautiful and those cupcakes look scrumptious! What beautiful pinks, such a joy to look aat. There are some people in this world who just make it better for having passed through it with their artist's touch, and you are certainly one of those people. Truthfully, I am speechless over the artistry on these posts. It is loveliness personified. I could spend all day absorbed in these pictures of your work. Thank you for taking the time to share it with us. If you have a book, I would love to know about it. I guess I had best search through your blog to determine the answer to that.